I have a copy of "The War History of the Sixth Battalion, the South Staffordshire Regiment (TF) - compiled by a Committee of Officers who served with the Battalion". Published by Wm Heinemann in 1924. Very useful for students of the regiment or of 46th Division. Happy to do look-ups, etc. A relative of mine, 2nd Lt. Arthur W. Motteram who enlisted with the 5th S. Staffs at Walsall in Sept 1914, is listed on the CWGC site as having been killed on the 21st May 1918 with that Battalion. However after he was wounded at the Hohenzollern Redoubt in Oct 1915, his records say that he was gazetted to the 6th S.Staffs in Sept 1917. Can you tell me if he was with the 6th in 1917/18 and anything of his service and death if that is the case? Arthur was definitely an officer of the 1/5th Battalion. He was commissioned as a Second-Lieutenant (Territorial Force) on 29th August 1917 from OCTU - London Gazette 14/9/17, page 9525. No battalion is listed, but he is not noted as being 6th Battalion attached 1/5th Battalion on any references I have one him, either his record from the PRO, the battalion nominal roll or in Officers Died in the Great War. He was posted straight to the 1/5th Battalion once he was commissioned. I think I sent you a copy of the details from the nominal roll some time back that confirm this. I hope this stops the confusion! The book has no index, which makes searching rather laborious. I've looked through it for the period mentioned and can see no mention of Arthur Motteram. Thanks for looking.The confusion arises because after his death all the details seem to contradict each other as to his battalion. Perhaps those that mention the 6th Bn. went off his initial posting and not his subsequent one on return to France. Andrew, is there any mention of what happened on the 21st May 1918 in the War Diary for the 5th Bn? I have a local memorial man, Pvt Stephen Emmerson KIA April 15th 1918, buried in Le Grand Beaumart British Cemetery. He was reg no 48090 with the 2/6th South Staffs. Would be grateful for a brief description of the battalions actions around this time. I am going to the regimental museum tomorrow to do some work on the 1/6 South Staffords. I will have a quick look at their war diary for September 1917 to see if any mention of him joining them then. Thanks Roy, that would be great. It may be that he returned to France in the autumn of 1917 with the 5th Bn., but in his service papers there is no mention of him serving with the 5th Battalion after he was wounded in 1915. All the info. contained about his death, personal effects, wages, memorial plaque say the 6th S.Staffs. If he was with the 5th South Staffs as other sources point out it doesn't say a lot for the record keeping of the day! I will have a look at his record again tonight to see if I can find out what happened to Arthur after he was wounded on 13th October 1915. As he was with the Machine Gun Section of 1/5th South Staffords when he was wounded, I think that he may have returned to France in 1916 at the time when the 137th Brigade Machine Gun Company was formed and was transferred to the MGC like his brother and his mate Sid Richards. I will get back to you on this. Arthur was at the Northern Command Depot at Ripon in1916/17. He returned to France around the time that Harold appeared to be going back to England as a MGC instructor at Grantham. I've just got back from the South Stafford's Regimental museum at Whittington. Having looked at the war diaries covering Aug., Sept., and Oct 1917, of both the 1/6 and 2/6 South Staffords, there is no mention of your man joining them. Looking at 21st May 1918 in both diaries, the 1/6th were heavily gassed near Gorre with the loss of 6 officers and 134 OR but Arthur was not one of them. A total of 7 officers were killed in the month, but again, not him. The 2/6th diary is very sparce on detail (or pretty well enything else) but reports that no officers were killed that day. Thanks for looking out for my chap. Clearly then the CWGC database is correct with the 5th Bn being Arthur's unit. I am still interested in knowing what happened on the 21/5/18 but that clears up one particular problem at any rate! Could I draw your attention to my post earlier in this thread on June 4th, I think it may have got swallowed up. Would be grateful for brief info. "Lieut. Col Curtis, now commanding, got his unit through the heavily shelled Poperinghe without casualties and established them, for the night of April 10th, in billets at Wieltje. Next morning he took over a line on the Passchendaele Ridge, only to receive orders to withdraw on the day following, destroying all stores behind him and evacuating all ammunition. The Battalion entrained at Wieltje, detrained at Vlamertinghe and was billeted at "Brake Camp". After two days march, it took over a Brigade line on the night of 14th/15th, relieving Yorkshiremen who had suffered heavily. Almost immediately it was isolated, by reason of the crowding of units on the flank, and received orders to withdraw. It was during this withdrawal that the transport was misdirected, and with difficulty extricated itself from the midst of the enemy. Meanwhile the main body had carried out a counter attack, suffering 180 casualties, and being relieved by French troops. But this relief was illusory, since the position in support was under heavy shell fire, in which D Company suffered the loss of their Sergeant Major, Quarter Master Sergeant, Orderly Room clerk, storeman and Cook Sergeant. On April 26th the Battalion found itself with the rest of the Division digging and maning a reserve line at Ouderdom..."
Hmmm. Not too helpful with regard to exact location, is it? Sounds like somehere down there in the hills. As far as I can see very few of the Battalion casualties at this time have a known grave. But here's one that might offer a clue: 43599 Private John Oakley is buried at Le Grand Beaumart British Cemetery, Steenwerck. My local man is also Le Grand Beaumart Cemetery, apparently made by fighting units and field ambulances in April 1918. I thought Battle of Bailleul, what do you think. Can I ask if that was the complete entry for 2nd/6th involvement with the Battles of the Lys? 59 Div were involved in the battles of Bailleul and First Kemmel. Yes, that was it. And I reckon you are right with Bailleul, Bob. Yes he will go into the write up as Battle of Bailleul. Could you do a look up on Lt Gerald Howard Smith KIA 29/3/16, if possible I would like to know where he was at the time of his death,there is some mention of him winning the MC would you have any info on this. Thank you for that info,this forum is amazing. It is so refreshing to see people on here willing to help and share info,especially with a novice like me. I would be grateful if you could have a look to see what 1/6 were doing this day. 1/6 South Staffordshire Regiment, 137th Brigade, 46th Division. Born, Bedale. Enlisted, Richmond. Resided, Bedale. That is a very famous date. One of the finest feats of arms in the war: The storming and crossing of the Saint Quentin canal at Riqueval and Bellenglise. When I get the chance tomorrow I'll try to post the entry from the book. Thankyou very much Chris. I'm looking forward to reading the account. Such men as might, slept well, a fact which may account in part for the high fettle in which the Battalion assembled on the evening of the 29th [september 1918] for the advance, in tin helmets, full battle order, life-belts and with the collapsible boats. The trenches were more than congested: they were so alive with bulky humanity that movement was almost impossible or, when made, was barely perceptible. The hours passed slowly, as the solid mass of infantry gradually converged upon the starting line. The weather was magnificent; the night dark, but particularly clear. This itself inspired the highest hopes, and the brightness of the dawn, free even of the slightest mist, brought these hopes to the zenith. Then gradually the mist rose, and spirits were damped. In the Official account this mist, always increasing in intensity, is mentioned as being of invaluable assist­ance; and so no doubt it was. But at the time it seemed to be a misfortune. Optimists among the men even refused to believe it was a mist, or that the attack was to take place in alarming, impenetrable obscurity. They explained it away, as being a new and ingenious form of smoke-barrage, which might be relied upon to lift at the appropriate moment. It did nothing of the sort; it grew in intensity, as the unit stood, in an atmosphere of quiet and almost deadly stillness, waiting for "zero" hour at 5.50 a.m. The stillness was at last broken by the sound of the signal gun, a few minutes before zero. Immediately there was the terrific clatter of the opening bombardment, rapidly developing into the indescribable din of a barrage. With the roar of the guns was heard the incessant rat-at-at-at-at of machine guns. The leaders of the attack clambered out of their trenches upon ladders, the officers going first and waiting until all were out. They advanced " in waves, at the pace of a slow walk and with a distance of three yards or so between each man. Thus they went for a distance of about 1000 yards, down a slope, then up, and then down again. Moving in this manner across Chopper Ravine, the successive waves came eventually to the Canal itself, taking about five minutes to cover each successive 100 yards, as it seemed, and certainly seeing no more than four yards ahead into the surrounding fog. The bullets of our own machine guns were passing little more than a yard or two overhead, and when the unit was halfway to the Canal the enemy bombardment, from guns of all calibres, began. On the near side of the Canal was found the first line of enemy trenches, sparsely held and easily overcome. These trenches were situated on an upward slope, and it was not until our men were over the crown of the slope and a hundred yards or so past this first line of enemy trenches that the water ahead of them was dimly seen. From close proximity it was found to be stagnant, fetid water, unin­viting for an early morning "dip." The sides of the Canal masonry were much broken; our barrage was now operating on the far side. At the near side the attackers paused, to reassemble and reorganise their forces in the thick blanket of mist. Orders had been issued for each man to enter the Canal as he came to it. From the one side the other side was invisible. The depth of the water appeared to vary, but to range about twelve to fifteen feet. The pausing attackers saw before them a sharp descent to the wall of the Canal, then a short, straight drop of a few feet, five or so. The water itself was disturbed only by the shells of the enemy guns, but into the water officers and men dropped, as they best could, those first to get in and through, encouraging the others with appropriate humour. The more skilful navigators threw a cable across to assist the less efficient; history does not tell us where the cables came from. Eventually all were across, soaked to the skin and with boots waterlogged. Captain Teeton came along the lines, standing on the wall, to ascertain what strength remained after the continuing casualties. These were not great, and the attack was now resumed, moving in one wave, up a slope, across an unoccupied line of trenches, which it was not considered necessary to ransack, and to the most heavily fortified line, which was of concrete structure containing formidable nests of machine guns. And here it was that the blessing of the mist was first appreciated. It must have been the saving of a vast amount of lives. "Are you Staffords?" our men had to shout, before they dealt with their victims. Parties of NCO’s and men overran the enemy trenches like locusts, after the now familiar manner of attack. German prisoners were captured in shoals, heavily protected dugouts disgorging numbers of terror-stricken men. So far as time and language permitted, they told our men of their awful situation, cut off from support and even food, as they had been, for some twenty-four hours by the operations of our artillery upon their lines of local communication. Meanwhile, that same artillery was still dropping its shells some twenty-five yards ahead, and at the same time the mist was so far lifting that it was possible to see now for a distance of forty, or even sixty yards. The clearance of this trench line, not the halting point of our unit, was effected with rapidity, and movement forward at once continued. The ground was not entirely unknown: in the days before it had been possible to see Bellenglise itself, and everyone had at least a rough idea of the direc­tion and intervening spaces. While the advancing lines went forward, detachments were still capturing and send­ing back to Headquarters prisoners innumerable. The machine gunners would open fire into each big dug-out from its very entrance, so that the more active inmates had to issue forth, running the gauntlet of their fire. When the summons was understood, the fire would cease, and then batches would emerge into the light. One Lewis gunner is reported to have said to an emerging German, "You're a dead 'un, unless you have got some fags!" and to have received at once the "hush-money" demanded. In the trenches themselves, a sergeant is stated to have rushed upon his officer, covered with blood and crying: "Have you seen any more Boches, sir? I've just killed five of 'em." For one NCO to extract single-handed, and secure, twenty-five prisoners from one dug-out was, apparently, not unusual, but characteristic of the affair. Meanwhile the advancing line had gone forward to the next German line, where the good work was busily continued, and when the rear lines had closed up, the whole unit, or that bulk of it which remained in action, halted according to plan, at 9.30 a.m.-10 o'clock on that triumphant morning of September 30th. The 188th and 189th Brigades leap­frogged our 187th and passed on. The position of our unit was stabilised, under the fire of the enemy artillery, at this line, and in this line they stayed until October 2nd. 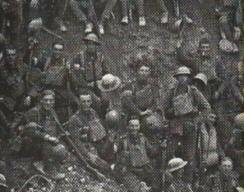 Below: Close-up from the famous photograph of men of the 46th (North Midland) Division, on the steep-sided canal bank at Riqueval, shortly after the events described above. Elsewhere on this picture, men can be seen still wearing the lifejackets with which they had been issued for the crossing of the canal.